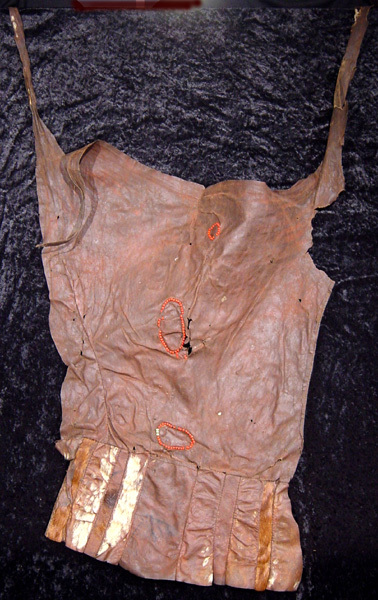 Borana tribe Cowhide leather dress made and worn by the Borana women and girls, cured with red ochre, decorated with beads. $250 Click here for payment information and shipping quote using item #. We will not list all so called "defects", so if this matters to you, please ask about specific pieces before making a purchase. These pieces have been well used and therefore may have cracks or other damage that has sometimes been repaired and sometimes not. The repairs were made in the bush with whatever was handy, such as strips of aluminum, leather, wire or even colored plastic, adding more interest to the piece. In our "throw-away society" we might find it hard to understand why these people would take so much time and care repairing an object. Unlike us, they didn't have the option of buying a replacement. It took a long time to create this item from scratch, so repairs often take less time than making a new one. We can all learn something from this.